These efforts will guarantee the sale of at least 100,000 tons of credits over the next three years. Here’s how it will work. Conduct a feasibility assessment of the WILF based on existing frameworks designed to finance carbon offset projects from avoided deforestation. Determine appropriate carbon credit prices for the fund, and determine the contribution that each investor will make toward purchasing a carbon credit, as well as how much and when the producers will be paid. Identify investor funds to catalyze the private purchases of credits, and evaluate market opportunities for different types of financiers to participate. Develop criteria for using CIG funds to support producers who implement conservation practices that do not ultimately qualify for carbon credits. The Working Lands Investment Fund will stimulate investment in conservation practices through the purchase of carbon credits generated by producers. A guaranteed purchase agreement driven by this private investment fund will set up the necessary infrastructure to purchase 100,000 tons of working land carbon credits over the next three years, across 140,000 acres. Guaranteed payment will provide producers with a revenue source in the event that a project fails to deliver credits or the credits cannot be sold on the voluntary carbon market. This eliminates the financial uncertainty that currently deters many producers from participating in carbon markets, and can help bring project participation to scale. To generate these credits, producers need knowledgeable, trustworthy project developers who can collect data, oversee projects and guide producers through the carbon generation process. Right now, a very limited number of project developers have invested the time necessary to become experts in any of the 10 existing working lands protocols and the related quantification methods. With the extension of California’s cap-and-trade market to 2030 and encouraging signs from the province of Ontario and the aviation sector, the demand for carbon credits is expected to increase in the future. When the agriculture carbon market scales up, there will not be enough developers capable of helping producers take advantage of the market opportunity. Developing a business case to provide information on the risks and the profit opportunities associated with creating agricultural projects. Writing handbooks and creating materials to guide developers through the necessary steps to generate carbon credits. 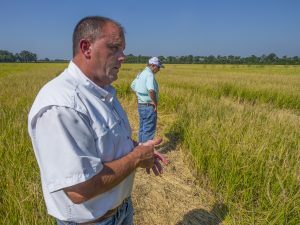 The reputation of carbon markets within the agricultural community is at stake when landowners expect financial returns from a conservation practice, but ultimately are not able to generate or sell credits resulting from their hard work. This project is a huge step in the right direction toward reversing this trend. This entry was posted in Carbon Market, Climate Resilience, Partnerships and tagged agricultural carbon markets, agricultural offset projects, arkansas, BlueSource, california, cap and trade, carbon credits, carbon markets, Carbon Offsets, CIG grant, ClimeCo, conservation, conservation innovation grant, Encourage Capital, grasslands protocol, investment, Natural Resources Conservation Service, private capital, purchase agreement, USDA, USDA NRCS, Working Lands Investment Fund. Bookmark the permalink. Both comments and trackbacks are currently closed.